I am really puzzled by the discovery of the election fraud in China’s Liaoning Province, resulting in “the expulsion last month of 45 of the province’s 102 National People’s Congress (NPC) deputies and 454 of the 612 members of the provincial people’s congress,” says SCMP in its report yesterday titled “Million-yuan bribes and money-back guarantees … how Chinese lawmakers bought their seats”. According to the report, the cash bribe each rich executive paid targeted electors for a vote ranged 500 to 5,000 yuan (US$80-800). As usually a candidate elected got above 90% of the votes. A candidate had to pay $40,000 to $400,000 bribes to be elected. That was quite a lot of money. However, it was a small amount compared with the tens of millions of yuan (equivalent to millions of dollars) one had to pay a powerful broker who usually was a political heavyweight such as the head of the regional legislature, to be selected as a candidate and ensure to be elected. What benefit will he get in return? SCMP says in another report on the scandal titled “Behind the NPC vote-buying scandal: how Beijing went on the warpath after its preferred candidates lost” yesterday that the status as a national parliament member will make it more difficult to launch investigations into the member’s affairs. The status of an NPC deputy is not high as there are nearly three thousand such deputies. Even minister-level officials cannot avoid investigations, how can the status of a common NPC deputy be a significant obstacle! The report says that the status enables the rich man to file legislative proposals and gain direct access to local officials to further his business interests. The proposal by one of the nearly 3,000 deputies can hardly attract attention, let alone be adopted. As for direct access to local officials to further one’s business interests, using the funds for election fraud to bribe relevant officials may be much more effective. Then why pay so much for so little return? It’s political investment. Rich people do not have lots of opportunities to invest the large amount of wealth they have accumulated. Expansion of their enterprises is limited by the size of their market. China’s stock market fluctuates wildly and is therefore risky for investment. Residential housing units are good value as their prices have kept rising over the past decades, but the land of the units is leased by the State for a limited duration, usually 50 years. What if the State imposes harsh terms for renewal of the lease or simply refuse renewal after expiration of the lease? Buying parliamentary seats is an alternative investment without risk. If one has been elected and has performed his obligations well after being elected, there is great chance for him to be re-elected. If he keeps on performing as a satisfactory NPC deputy and taking care of local interests, his family may become popular in his constituency. Rich people have no political status now in their respective constituency, but if they have kept working satisfactorily as members of local parliaments or NPC deputies, they will gradually gain the status of local gentry. 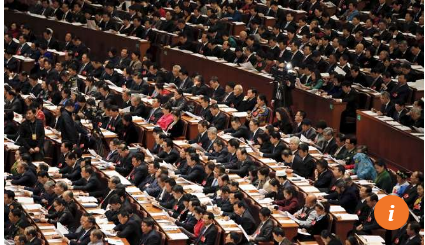 The large number of rich businessmen buying parliamentary seats at the same time proves Chinese businessmen’s shrewdness as well as political awareness. They are in fact creating a business lobby in Chinese parliament to promote their interests, i.e. they are unconsciously forming an interested group. That must be exaggeration. Most of the candidates are usually nominated by local authorities while only a few of the candidates are Central authority’s choice. The bribes may not be substantial enough to cause those chosen by Central authority to lose in the election. Local officials at least have the common sense that such election failure may upset Central authority and give rise to serious trouble. China now is not ruled by Hu Jintao, a weak leader that local official such as Bo Xilai dared to challenge. China is now ruled by a strongman Xi Jinping who closed all the illegal jails set up by local officials in Beijing a little over 2 weeks after he took over and released all the thousands prisoners from the jails. By so doing, he dealt a heavy blow at powerful local officials. The success of the campaign has enabled him to investigate and punish high-ranking corrupt officials. Xi has established a sound power base now and need not worry that his game plan may be undermined. We can actually look at rich American and rich Indonesian as comparison. Rich American buys democracy to gain power once they become rich. They become American rich and powerful. They managed to protect themselves from any social upheaval they caused such as 1920s Great Depression and 2008 GFC. They can influence politics, make unfair and unjust legislations, even incite genocide to other nations to get resources monopoly, like in the 1960s American genocide in Indonesia, where American elites became influential in Indonesia eventhough they were not Indonesian or even have never been to Indonesia. Rich Indonesian never wants to get involved in politics, thus they never buys democracy, seeks power or other protections, and they always got wiped out by every social upheavals. From the Dutch colonization of Indonesia, WWII Japanese invasion, 1960s American genocide to establish themselves to gain monopoly on their own front yard, and lately in the 1990s fall of the pro-American dictator regimes. The rich American never have these kind of bad lucks. Similarly in China, it is equally important to buy influences and powers, to gain protection and other more greedy purposes. Buying expensive meaningless legislative seats is just one way. Chinese are quick learners, and they learns from the American quickly. Buying position in government is after all not a strange thing in China since ancient time. It is just an outrageous thing the rich do with their money. The question should not be what do they gain with buying legislative seats, it is just ‘rubber stamp’ seat anyway. The question should be how the Chinese government regulates it. If it is a ‘rubber stamp’ seat, it may be a mere symbol of prestige. Unchecked and unregulated, it may cause problems ad it may be vulnerable to corruptions and foreign infiltrations. Well Written — Agree, if left unchecked will lead to corruption. Unscrupulous business people will always look for loopholes. The best loopholes are within Government. Bribes are bribes is Corruption. A complementary explanation is that the NPC is no more a rubber stamp than the US Congress. It can and does delay and even derail legislation.